On January 23, the Valdai Discussion Club hosted an expert discussion, titled “Sanctions and the Oil and Gas Sector: Political Risks for Business”. The Russian oil and gas sector has long been under the influence of sectoral sanctions, introduced by the US and the EU. In 2019 an escalation of the US sanctions is expected. The Congress will consider relevant bills, and the US administration will implement the CAATSA rules, presidential decrees and other regulatory acts. Political relations between Russia and the West remain tense. The oil and gas sector is the main target for restrictive measures. The adoption of new sanctions against Russia may become an obstacle to the Nord Stream II project. Many European states are interested in this project, above all Germany. Equally important are the economic interests of the external players, who would not mind to occupy a niche in the European oil and gas market. What are the prospects for the sanctions escalation? What will be their future impact on Russia's oil and gas sector? What are the current opportunities to manage risks of sanctions? The participants of the discussion will answer these and other questions. Alexei Grivach, Deputy Director General for Energy Projects at the National Energy Security Foundation (NESF). 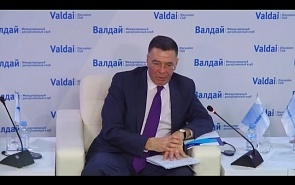 Andrey Bystritskiy, Chairman of the Board of the Foundation for the Development and Support of the Valdai Discussion Club.